At times it is more interesting to watch what the people are doing in the backgrounds. It could even be possible to play a drinking game with this video if you took one drink every time you saw another cosplayer that is dressed better than the one being interviewed, or take two drinks every time a person walks by with fanzines. Nearly 75 percent of the news documentary is shot outside of a convention center, making the picture quality to vary at times. Brightly colored costumes with neon or shiny colors like hot pink appear overally white on camera. The Japanese language video features dark green subtitles that help to make these lighting problems all the more worse on the eyes. Also it can be seen that nearly 95 percent of the cosplayers featured are girls ages 12 to 20 something. Most of which don't want their families to find out what they are doing. 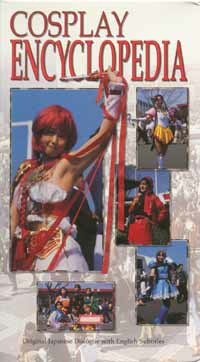 In the beginning, the questions concerning cost of the costumes or materials, who helped making it, and do your parents know about you cosplaying are interesting. But, these questions becomes rather annoying, as do their answers, as they are they are posed to every person interviewed. Scattered at points are a top ten of cosplay costumes which are modeled by the same person and a visit to a supply store that turns into an international plug for the store during the credits. Overall the volume is a dull and repetitive look at an aspect of fan culture that works best in photo stills (as presented in Chibi Pop Manga) rather than a video documentary. For those studying Japanese, this volume may prove useful in that it gives a real world, warts and all, look at how Japanese is used in a fan based setting. For the same amount of money you can get the dub of the Sailor Moon R: Promise of the Rose Movie.